Access to Capital. Established equity channels, from both private and institutional sources, give us the ability to act quickly and decisively on opportunities. Competitive Market Positioning. We focus on mid-sized projects in the $3- to $10-million range that usually fall beyond the reach of individual investors and outside the interests of institutional investors. This means that we do not compete with large energy hedge funds or single investors, which gives us a competitive edge in pursuing prime projects in a smaller playing field. A Broad Project Focus. We are looking to build a very diversified portfolio where value may be generated at various stages of development. This broad focus allows our team to consider projects in their infancy or projects near full-cycle. An Alternative Outlook. We do not limit our potential to traditional energy investments. We’ve had our investment dollars in the alternative and renewable energy sectors long before “green” became a media buzz word. We have the experience it takes to critically examine how to complement our traditional energy portfolio with key renewable energy opportunities. Our acquisition strategy is fueled by the belief that there are infinite possibilities for opportunity within the energy sector. 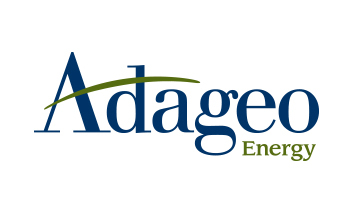 Adageo Energy’s diversified asset portfolio features multiple revenue streams from both traditional and alternative energy projects. In addition, we seek to acquire assets that may be actively developed to enhance overall portfolio value. Further, we execute our acquisition strategy by investing in a select number of assets. These mid-sized acquisitions offer us the ability to provide significant operational oversight to maximize each project’s performance expectations.